Joy De Vivre has played such a fun role in my life! I have met some great friends and had so many awesome people come to visit on here. But sometimes we need a change! I have created that over at ChannellingDolly.com! I would love for you all to come and visit me there! It is super fun, a little similar to Joy De Vivre, but still very much a work in progress. For anyone who has left me messages here I so apologize. Upon logging in today I realized I did not receive an alert for the comments I had waiting. Anyway this isn't goodbye to Joy De Vivre just I will see you later old friend. If you have any questions about any of the posts on here feel free to drop me a line at the new site! I would be happy to chat with you! Some days I love to dress girly, others days though I prefer a little edgier style. Nothing bridges that gap like skulls..with a twist. 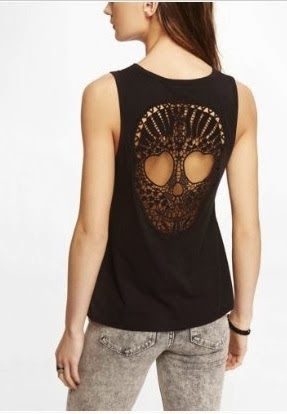 We are not talking Hot Topic Gothic style here, but cute skulls. Cute skulls? Yes, there is such a thing my friends. I purchased this top from Express this weekend and I can not be more happy with the look, not to mention a great price to boot at only $29! How pretty is this intricate necklace from Ettika? 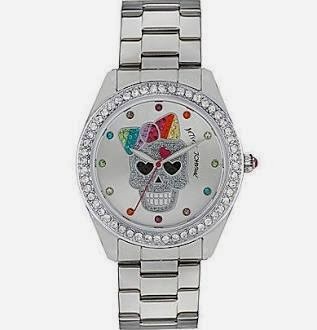 This watch comes to us from none other than the queen bee of girly style...Miss Betsey Johnson! 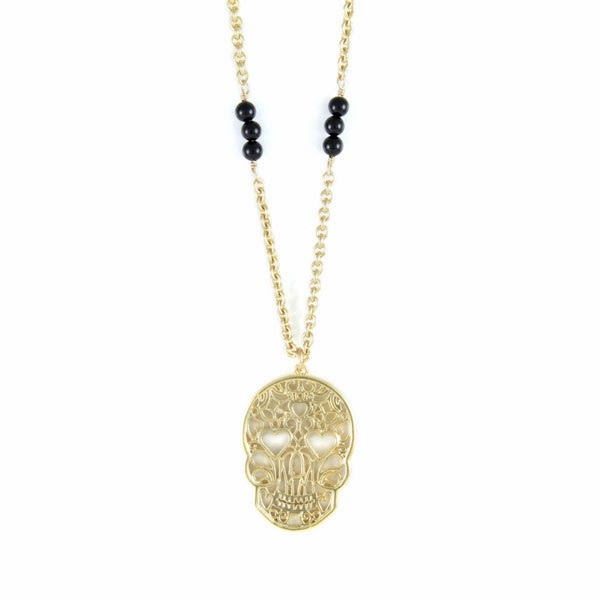 What do you all think of the skull trend? 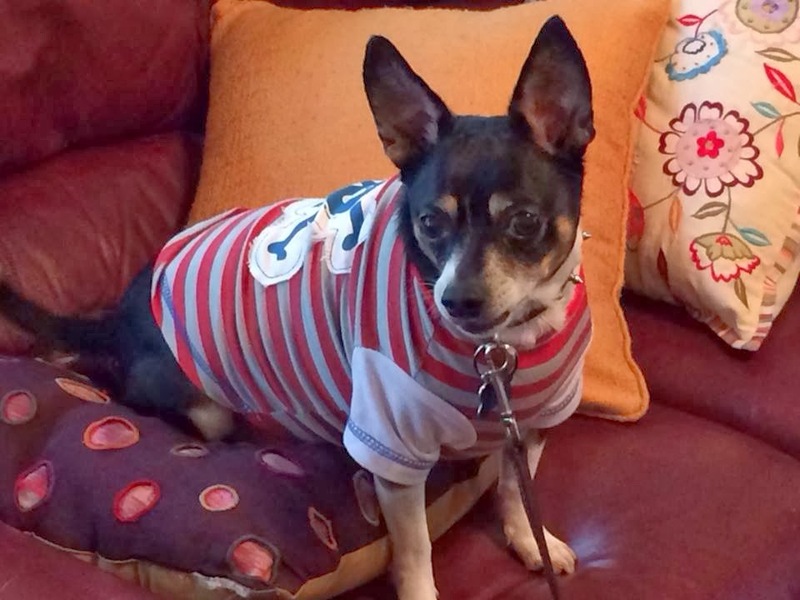 I have never really written about this much on my blog, but I wanted to put a warning out there to all of you with furry kids. As many of you who have read my blog for some time, and heck even someone who has just skimmed it, would know Barkley is my boy..my life..my everything. He is my fuzzy child and best friend. 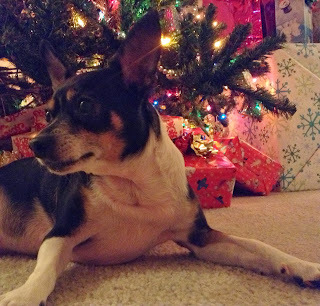 Last August, shortly after we celebrated our nine year adoption anniversary of Bark we noticed some things going on. First off he was drinking a lot of water. Twice as much as usual. At first I wrote it off to the fact that we live in Houston and it is freaking hot in August! Then a few days later we came home and he had peed in the house, multiple times. This was very strange for a boy who NEVER went before we came home from work. He had went on his bed and multiple places on the floor. After searching Web MD, (yes you can terrify yourself on there about your pets, just as much as you can about yourself), I saw that the possible causes could be a urinary tract infection or diabetes. I never even knew before that day that diabetes could attack pets. My father has it so I have an understanding of what it can do to humans, but who knew about dogs!? After reading that, I began panicking that this was not a good sign so we rushed Barkley to the after hours vet ER. There they confirmed my fear that it was indeed diabetes. Needless to say we were devastated that this disease was going to cause pain to our boy. The vet at the pet ER was unfortunately not the most helpful or compassionate person I have ever met. After calling Barkley fat and after I restrained myself from wanting to knock her out (such a good thing that I do not have human kids! Bullies would all be laid out flat and I would be in jail! ), we took him to his real vet for more testing the next day. His vet at Banfield was wonderful and explained to us that as long as we take care of him, give him two shots of insulin daily, take him to get his glucose tested regularly and feed him a special diet that he could still live a happy and healthy life. I wanted to write this as a warning to any of you out there that has a pet in your life that you are crazy about. If you start seeing them drinking more water and using the restroom more than usual or having accidents please take them into the vet immediately. They told us that because we knew Barkley's behavior so well and noticed something had changed quickly that we were able to help him before it got worse. It is so important to start treatment as soon as possible with diabetes so as not to suffer from further complications. 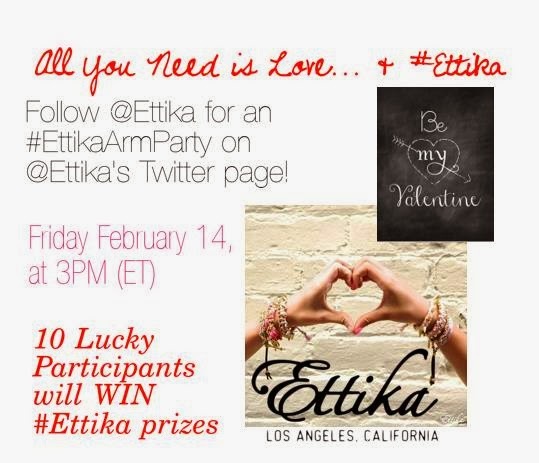 In my last post I introduced you to Ettika. Through a fellow friend and Glambassador I learned about them recently and let me say I am very impressed. Looking through their site I chose this gorgeous necklace online last week. I had my eye on several different pieces, but narrowed it down to this one, because I have a thing for gold and big dramatic stones. Not to mention that green is my favorite color. Despite not doing a rush delivery it arrived in just a couple of days and it is just lovely. The color and craftmanship is perfection. 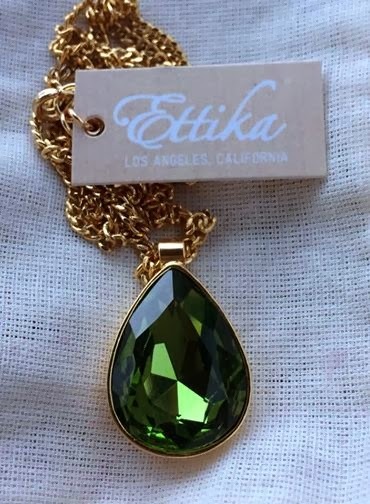 I highly recommend Ettika.com to you guys if you are looking for standout accessories! Check them out! From my home to yours...best wishes for a Merry Christmas! I had seen several different versions of the craft below. Some featured the trees on top of the cars sitting out for decoration, while others put them into a jar with fake snow creating a snow globe. 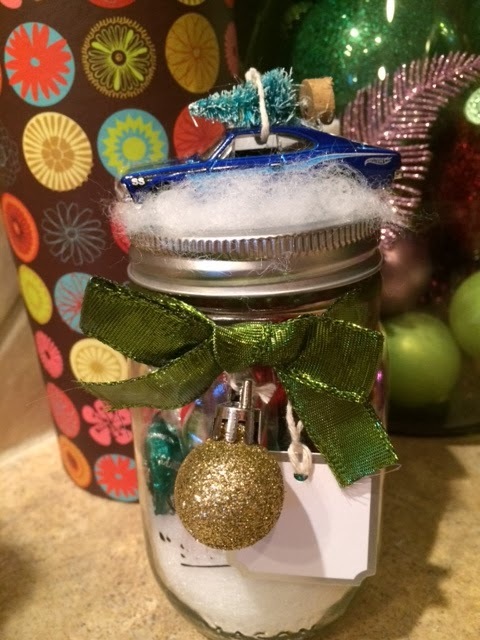 All were darling ideas, but for a gift to take to my coworkers I opted to glue the car on top of a jar of candy. 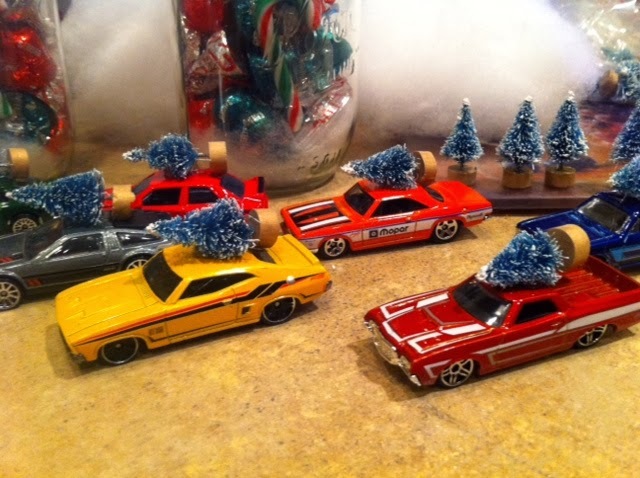 Cute cars carrying a tree plus chocolate...they were a hit. Next fill up mason jars with a small amount of snow at the bottom and lots o' chocolate. Tie a ribbon around the top. Tie an ornament on, attach a gift tag and then tie in a bow. Next assemble your cars. I purchased Hotwheels, but any small cars will work. Place a small dot of hot glue on top of the car then push the tree on top. Once the glue is cooled tie a piece of twine through the window of the car and on top of the tree. You are now ready to assemble your jar topper. Glue a ball of fake snow on top of the jar, (for this I found Tacky Glue worked better than hot glue). Hot glue is recommended for the last step..gluing down the car. Put a generous amount of glue on all four wheels and the entire underside of the car to ensure it stays put. Then you are done and have a crafty little surprise for your friends! I have also been looking for a centerpiece for the dining room table. When I couldn't find exactly the right thing I decided to craft it from ideas I found...guess where! Yup, Pinterest. For this one I found some cheap glass candlesticks at the $1 store. 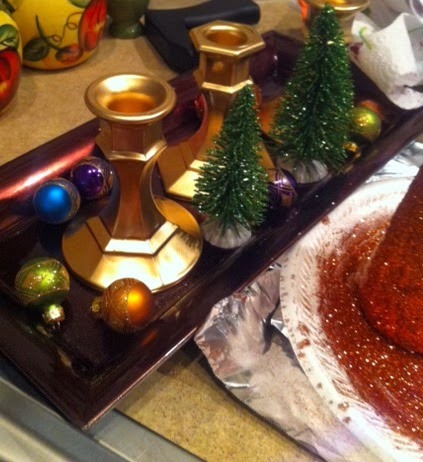 I spray painted them gold and put then in a decorative tray. I found three foam cones and glitter to match my decor. 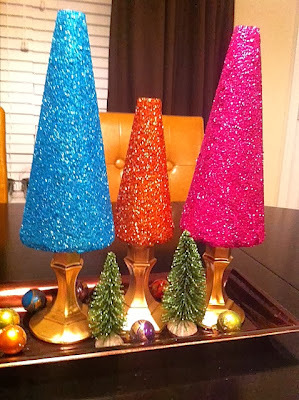 To make glitter trees get Elmer's glue and put a small amount of water, I suggest 1/4 water to the amount of glue. It should be easy to brush on the foam, but not too runny. 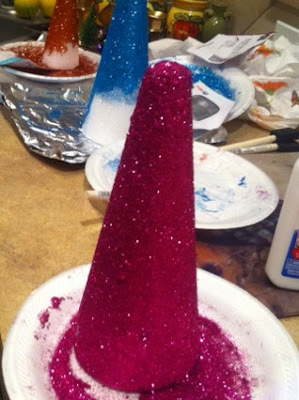 Mix the glue and water and start brushing the mixture on the cone with a foam brush. As you get a section glued begin sprinkling glitter on. I worked section by section. You may have to go over spots as it dries since the foam is very porous and requires quite a bit of glitter. I figured out something that I will pass on as a tip. I was having to let it dry section by section, but got the idea to use a skewer stick so that I could let the entire thing dry at once. Stick them somewhere to dry. 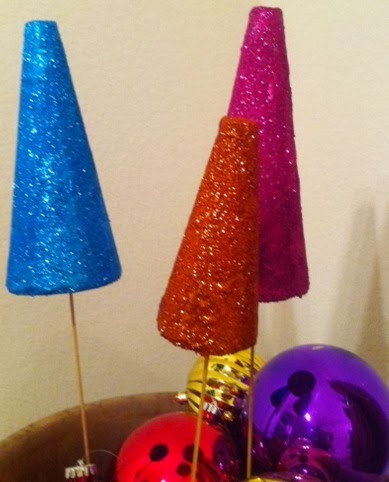 When fully dry, glue your cones to the candlesticks, (I used Tacky Glue for this as the hot glue kept peeling off my painted candlesticks). Then viola you have created your own centerpiece! Have you found any Pinterest ideas that you gave your own spin to? If so I would love to see them!